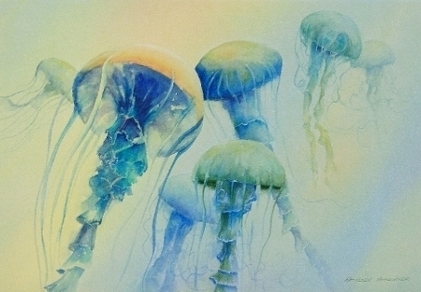 Welcome to my online gallery of “transparent” watercolors and new oil paintings. 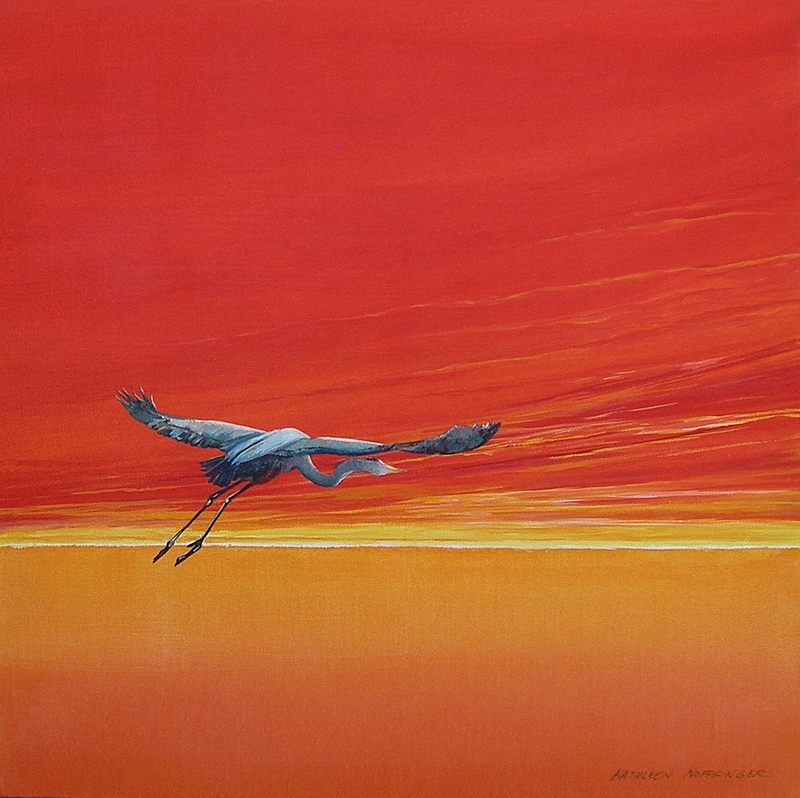 I love to create an impression of luminosity in my subjects of wildlife and nature and call my style of painting “impressionistic realism”. While balancing good design concepts, my goal is always to render a likeness creatively rather than photo realistically. 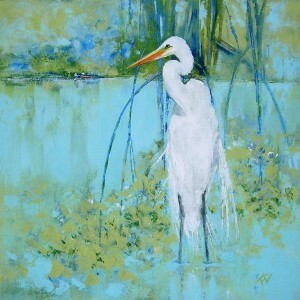 Please browse this site to learn more about my work and how I get my inspiration. 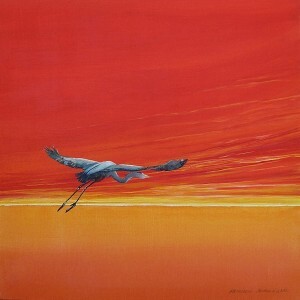 I accept a limited number of painting commissions each year and welcome inquiries and feedback via the “contact” page. I also love sharing my painting techniques with my art students and we learn together to see the world through “artist eyes”. 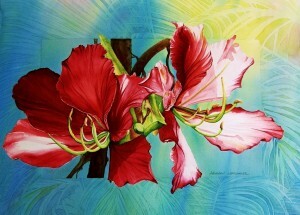 I invite you to join one of my workshops which are listed on this website. New techniques are always exciting and I recently experimented with watercolor on canvas… favorite subjects and media on a different texture. And my latest artistic adventure is working with “oil and cold wax medium”, first taking several workshops to learn the process and then spending some time in my studio playing with all of my new art supplies. I’ll be continuing to post new “contemporary impressionist” paintings during 2019. 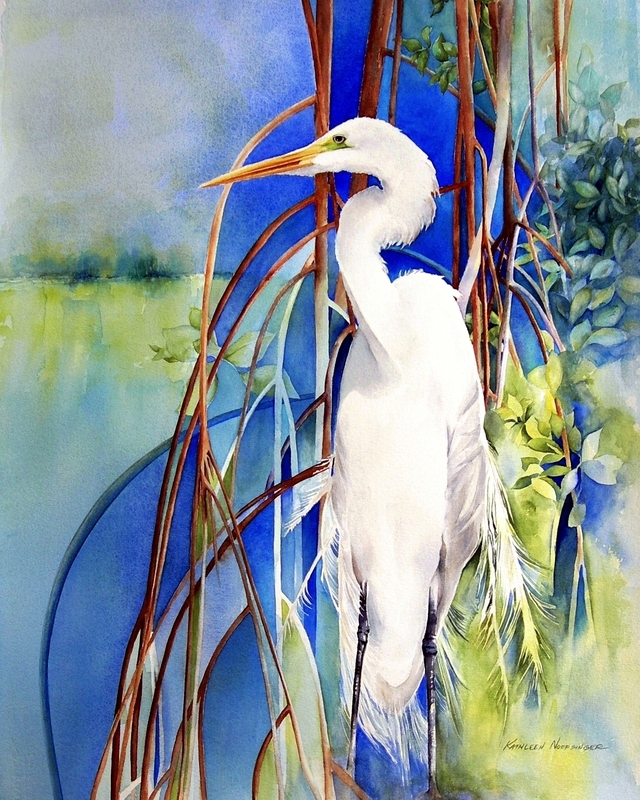 “Mangrove Sanctuary” received an “Award of Excellence at the 2016 Virginia Watercolor Society Exhibition. Thank you juror and judge Mel Stabin for this honor. My second version of this painting is in Oil and Cold Wax…using my same compositional sketch. I call this recent painting “Mangrove Sanctuary Deconstructed”. 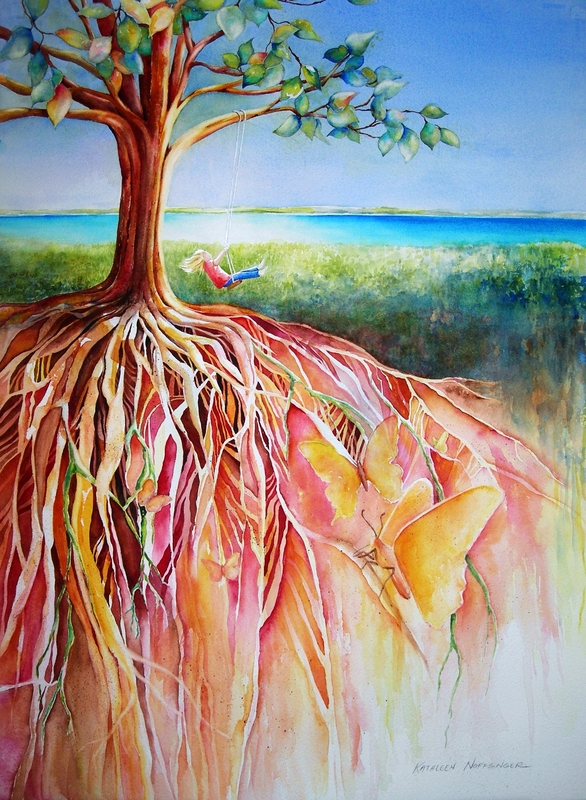 “Life of Tree – Wings and Roots” was inspired by the verse that there are two gifts we should give our children: “Wings to fly” and “Roots to come back home”. I added a child on a swing and butterflies hidden in the roots in this contemporary watercolor. 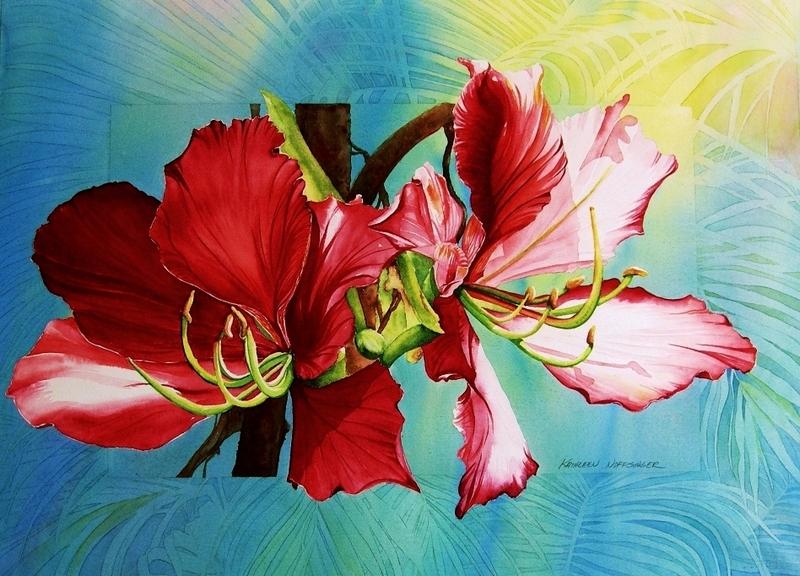 “Red Orchids” is one of my border paintings using the technique of “negative” painting in the palm-leaf border – it was juried into the “Art Speaks” Virginia all-media show in April, 2016, at the Bay School Community Art Center in Mathews, VA. 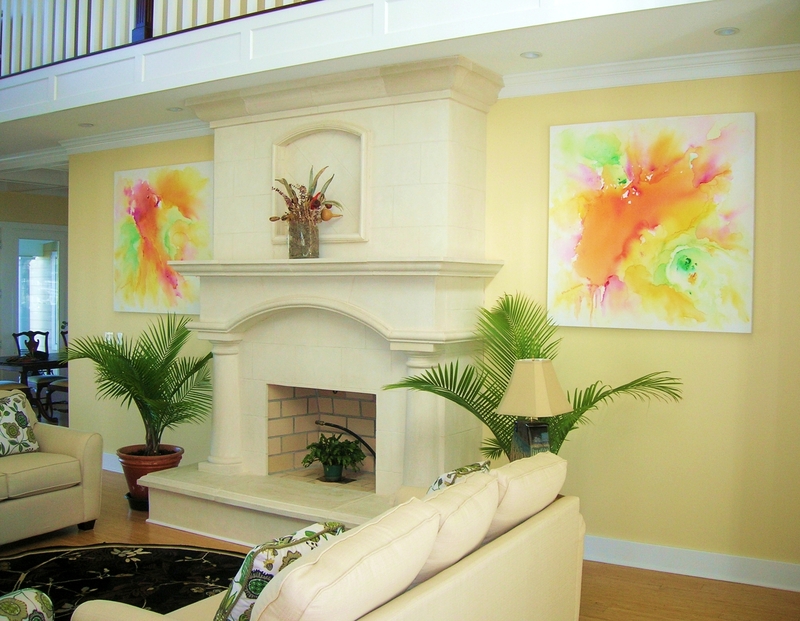 Here are two recent commissioned watercolor paintings on 48″ x 48″ canvas on the wall of my client’s stunning contemporary home. How did I do that? 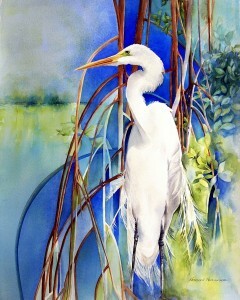 I am often asked that question and here is an answer regarding my watercolors. Since my ideas come from many sources I like to have a “painting plan”. Although each painting is different, I begin with a compositional plan of lights and darks in a 2” x 3” value sketch in my sketchbook and proceed to a full-size pencil drawing on my watercolor paper. 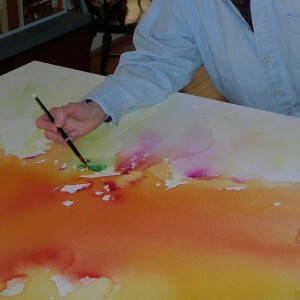 I use various traditional and contemporary watercolor techniques to apply color and sometimes spray or pour the paint onto the paper or canvas. In all of my work I use both large and small brushes loaded with very transparent colors, adding layers of paint to create transparent glazes. I rarely use opaque watercolor pigments. 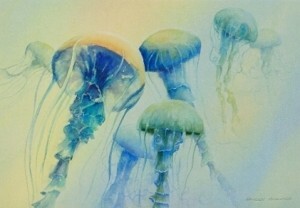 If you look closely at my work, you can see “negative painting” in the osprey nests, light “poured” into the water in “Jellies” (pictured) and clear transparent “luminous color” in the seascape paintings of the Florida Keys. I hope you enjoy viewing my paintings as much as I enjoyed the painting process!